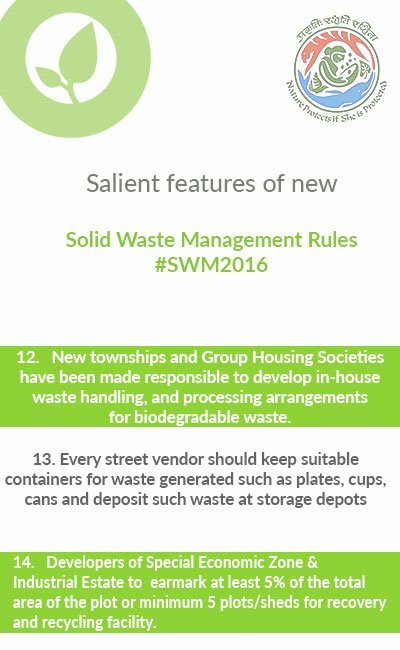 The Union Ministry of Environment, Forests and Climate Change (MoEF&CC) recently notified the new Solid Waste Management Rules (SWM), 2016. 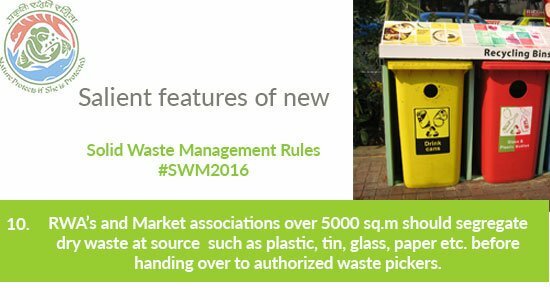 These will replace the Municipal Solid Wastes (Management and Handling) Rules, 2000, which have been in place for the past 16 years. These rules are the sixth category of waste management rules brought out by the ministry, as it has earlier notified plastic, e-waste, biomedical, hazardous and construction and demolition waste management rules. The new rules are now applicable beyond municipal areas and have included urban agglomerations, census towns, notified industrial townships, areas under the control of Indian Railways, airports, special economic zones, places of pilgrimage, religious and historical importance, and State and Central Government organisations in their ambit. 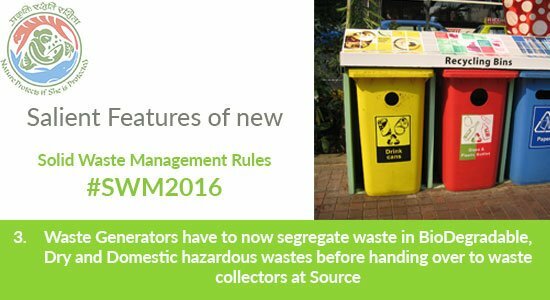 The new rules have mandated the source segregation of waste in order to channelise the waste to wealth by recovery, reuse and recycle. Waste generators would now have to now segregate waste into three streams- Biodegradables, Dry (Plastic, Paper, metal, Wood, etc.) and Domestic Hazardous waste (diapers, napkins, mosquito repellants, cleaning agents etc.) before handing it over to the collector. Institutional generators, market associations, event organisers and hotels and restaurants have been directly made responsible for segregation and sorting the waste and manage in partnership with local bodies. In case of an event, or gathering of more than 100 persons at any licensed/ unlicensed place, the organiser will have to ensure segregation of waste at source and handing over of segregated waste to waste collector or agency, as specified by the local authority. 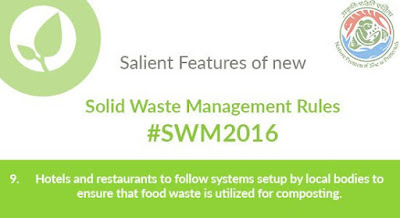 All hotels and restaurants will also be required to segregate biodegradable waste and set up a system of collection to ensure that such food waste is utilised for composting / biomethanation. The rules mandate that all resident welfare and market associations and gated communities with an area of above 5,000 sq m will have to segregate waste at source into material like plastic, tin, glass, paper and others and hand over recyclable material either to authorised waste-pickers and recyclers or to the urban local body. The manufacturers or brand owners of sanitary napkins are responsible for awareness for proper disposal of such waste by the generator and shall provide a pouch or wrapper for disposal of each napkin or diapers along with the packet of their sanitary products. As per the rules, brand owners who sale or market their products in packaging material which are non‐biodegradable, should put in place a system to collect back the packaging waste generated due to their production. The new rules have given power to the local bodies across India to decide the user fees. Municipal authorities will levy user fees for collection, disposal and processing from bulk generators. As per the rules, the generator will have to pay “User Fee” to the waste collector and a “Spot Fine” for littering and non-segregation, the quantum of which will be decided by the local bodies. Also, the new rules have mentioned about the integration of rag pickers, waste pickers and kabadiwalas from the informal sector to the formal sector by the state government. The rules also stipulate zero tolerance for throwing; burning, or burying the solid waste generated on streets, open public spaces outside the generator’s premises, or in the drain, or water bodies. As per the new rules, it has been advised that the bio-degradable waste should be processed, treated and disposed of through composting or bio-methanation within the premises as far as possible and the residual waste shall be given to the waste collectors or agency as directed by the local authority. The developers of Special Economic Zone, industrial estate, industrial park to earmark at least 5 per cent of the total area of the plot or minimum 5 plots/ sheds for recovery and recycling facility. Waste processing facilities will have to be set up by all local bodies having a population of 1 million or more within two years. For census towns with a population below 1 million or for all local bodies having a population of 0.5 million or more, common, or stand-alone sanitary landfills will have to be set up in three years time. Also, common, or regional sanitary landfills to be set up by all local bodies and census towns with a population under 0.5 million will have to be completed in three years. Also, the rules have mandated bio‐remediation or capping of old and abandoned dump sites within five years. As per the rules, the Department of Fertilisers, Ministry of Chemicals and Fertilizers should provide market development assistance on city compost and ensure promotion of co‐marketing of compost with chemical fertilisers in the ratio of 3-4 bags is to 6-7 bags by the fertiliser companies to the extent compost is made available for marketing to the companies. Also, the Ministry of Agriculture should provide flexibility in Fertiliser Control Order for manufacturing and sale of compost, propagating use of compost on farm land, set up laboratories to test quality of compost produced by local authorities or their authorised agencies. 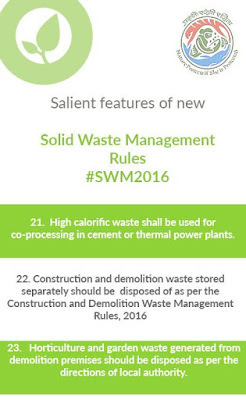 In a not-so welcoming move, the SWM Rules, 2016 emphasise promotion of waste to energy plants. The rules mandate all industrial units using fuel and located within 100 km from a solid waste-based Refuse-Derived Fuel (RDF) plant to make arrangements within six months from the date of notification of these rules to replace at least 5 per cent of their fuel requirement by RDF so produced. The rules also direct that non-recyclable waste having calorific value of 1500 K/cal/kg or more shall be utilised for generating energy either through RDF not disposed of on landfills and can only be utilised for generating energy either or through refuse derived fuel or by giving away as feed stock for preparing refuse derived fuel. High calorific wastes shall be used for co-processing in cement or thermal power plants. As per the rules, the Ministry of New and Renewable Energy Sources should facilitate infrastructure creation for Waste to Energy plants and provide appropriate subsidy or incentives for such Waste to Energy plants. The Ministry of Power should fix tariff or charges for the power generated from the Waste to Energy plants based on solid waste and ensure compulsory purchase of power generated from such Waste to Energy plants by discoms. As per the new rules, the landfill site shall be 100 metres away from a river, 200 metres from a pond, 500, 200 metres away from highways, habitations, public parks and water supply wells and 20 km away from airports/airbase. Emission standards are completely amended and include parameters for dioxins, furans, reduced limits for particulate matters from 150 to 100 and now 50. Also, the compost standards have been amended to align with Fertiliser Control Order. As per the new rules, construction of landfills on hills shall be avoided. Land for construction of sanitary landfills in hilly areas will be identified in the plain areas, within 25 kilometers. However, transfer stations and processing facilities shall be operational in the hilly areas. The government has also constituted a Central Monitoring Committee under the chairmanship of Secretary, MoEF&CC to monitor the overall implementation of the rules. The Committee comprising of various stakeholders from the Central and state governments will meet once a year to monitor the implementation of these rules. 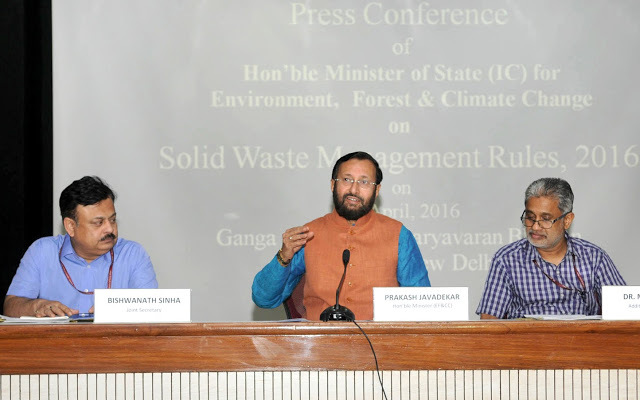 It will take almost 4-5 years to see the drastic change in how the waste management regimes will work in India. The SWM Rules, 2016 diminish hopes in pushing for adoption of a decentralised mechanism for solid waste management. However, it would be challenging to see how segregation at source shall work on the ground. A massive awareness campaign in association with communities, NGOs, students and other stakeholders needs to be planned to push for better implementation of these rules. The Rules need to focus on making solid waste management a people's movement by taking the issues, concerns and management of solid waste to citizens and grass-roots.